Rathfriland YFC are delighted to announce their first event to commemorate the milestone anniversary with a sponsored cycle challenge. This will take the form of 75km for 75 years. 12 members consisting of Stephen Gordon, Lois Bingham, Rachael McMinn, Alison Gracey, Roberta Simmons, Colin McMinn, Hannah Cromie, Matthew Murphy, Neil McMinn, Elizabeth Simmons, David Bradford and John McCabe will undergo training with Mark McDonald PT Rathfriland, before they embark on a sponsored 75km cycle though the Mourne scenic route of County Down. This will take place on Saturday, April 27 at 9am starting from their club hall in Rathfriland. The route will then proceed through Castlewellan, Newcastle, Annalong, Kilkeel, Rostrevor, Warrenpoint and finishing at the Southern Area Hospice in Newry. Club members had the chance to vote at the club’s annual general meeting in January for a partner charity for their milestone year. The charity chosen was the Southern Area Hospice. Southern Area Hospice Services (SAHS) provides invaluable support and care to people living within the Southern Health Board Area, who are suffering from Cancer, Multiple Sclerosis, Motor Neurone Disease and AIDS. Their aim is to provide the best quality of life for patients and their families. All hospice services are provided free of charge however, they rely heavily on voluntary donations to continue providing this special care. Southern Area Hospice Services relies on 73p in every pound coming from fundraising to enable them to care and support patients and their families. The fundraising department has to raise £2.6 million in 2018 to maintain the level of care currently available. This equates to £216,666 per month, £50,000 per week or £7,123 per day, therefore making it an extremely worthy charity to support. 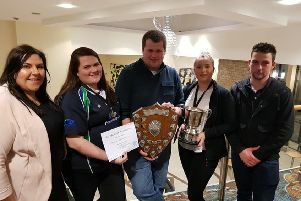 At the end of their 75th year the Rathfriland YFC will have a monetary presentation to the Southern Area Hospice which will be a proportion of proceeds raised through the various events they propose to hold throughout the year. This will include a proportion of the proceeds from the club’s 75th anniversary dinner which is due to be held on October 19 in The Belmont Hotel, Banbridge. The evening will be a great way for past and present members, family, friends and acquaintances of the club to come together and reminisce through the 75 years so they would encourage you to put the date in your diary. In relation to the club’s upcoming cycle, you can sponsor the club and the members taking part individually through sponsor forms and through Just Giving, a link will be available in due course. Bucket collections will also be in each town during the cycle. Every little helps. Follow the Facebook Rathfriland Young Farmers’ Club to keep up to date with the event.